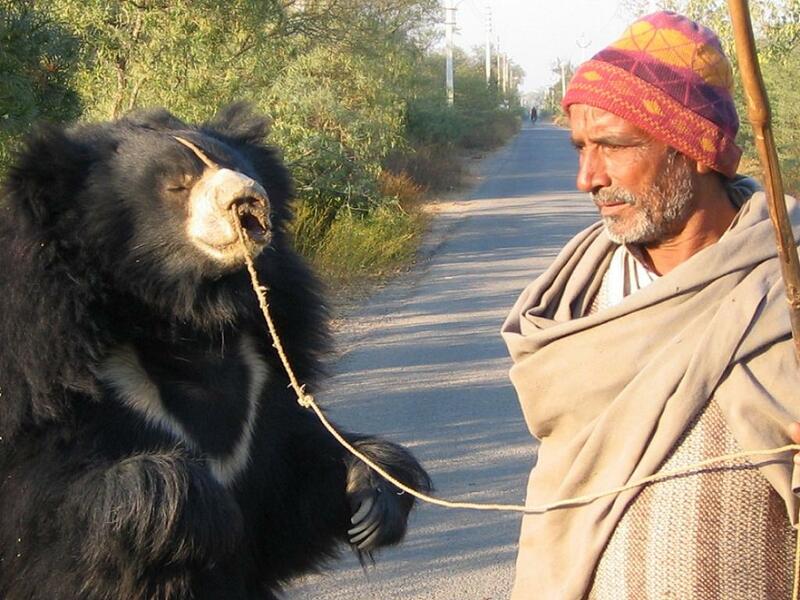 December 19 was the day of freedom for Rangila and Sridevi-the last known dancing sloth bears of Nepal. On that night, both were rescued by the Nepalese police along with the help of the Jane Goodall Institute of Nepal and World Animal Protection, both global wildlife organisations. The police were able to locate the bears in Iharbari, Nepal by tracking the mobile phone of the bear owners. The rescuers found the bears in an extremely distressed state, showing signs of psychological trauma such as cowering, pacing and paw sucking. The two survivors are now in temporary care of Amlekhgunj Forest and Wildlife Reserve. Bears like Rangila and Sridevi are snatched from their mother at an early age and forced to perform. Their owner had pierced their nose with a burning hot rod and shoved a rope through it – to retain control of the large animals. Harsh training methods are then used in order to have them submissive enough to perform to tourists. “Rangila and Sridevi have suffered for too long in captivity since they were poached from the wild. It’s extremely distressing to see animals being stolen from the wild and the sad reality is there are more wild animals suffering across the world, purely for the entertainment of tourists. I am pleased that for these two sloth bears at least; a happy ending is finally in sight,” Neil D’Cruze, Wildlife Expert working with World Animal Protection said. While the use of bears in the entertainment industry continues in Pakistan, it has been stopped in Greece, Turkey and India. Exploitation of bears in Asia is rife in the form of bear-baiting blood sport and in the cruel and unnecessary bear bile industry, where approximately 22,000 Asiatic black bears stuck in tiny cages, with permanent holes in their stomach and constantly milked for their bile. Their bile and gallbladders are dried, powdered and sold as panacea to be used as ‘traditional medicine’.